Take tomatoes and cut into big pieces. Make tomato puree In the mixture. Straining the puree is optional. Add salt, pepper, red chilly powder, garlic, sugar and cook it for 8-10 minutes. Do not add water as the consistency should be thick. 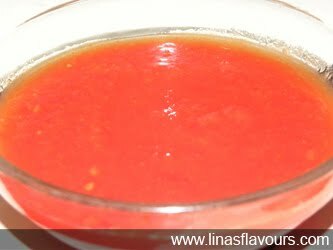 You can use this sauce for any curry, vegetables, bhel, chaat, pakora etc. and instead of tomato ketchup also.